Hiking through Fish River canyon, the second largest canyon in the world is quite exciting, isn’t it? This hike was in our bucket list for a couple of years and finally we’ve done it! 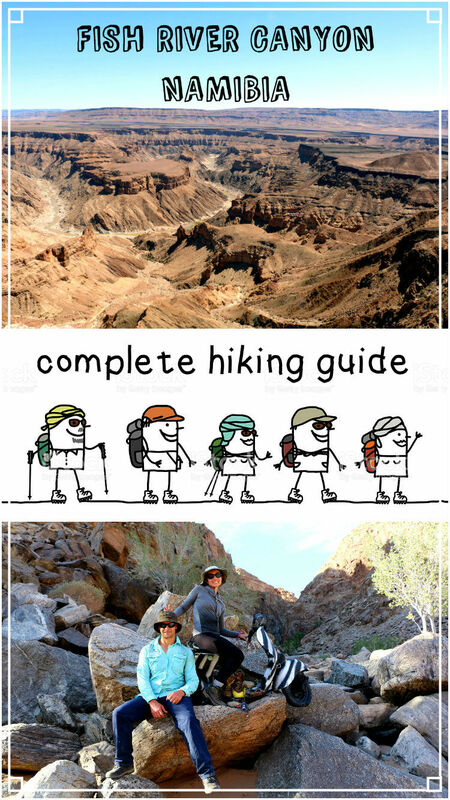 Some guide books say this is the toughest hike in Africa, don’t know about it we’ve done only few hikes mostly in South Africa but Fish River is definitely a hike to add to your must do hiking list. Total distance of the trail 86km, the river itself is longer but due to many shortcuts your walking distance is about 14km less. In this post is a step by step hiking guide; Fish River canyon route map, budget, booking details, accommodation options, shuttle, packing list and more. What time of the year can you hike Fish River canyon? From 1st May till 15th September, only these months, any other time it’s impossible due to very high temperatures. The hike itself costs NAD330/US$25 per person. Park entrance fee NAD60/US$4,5 for South Africans and NAD80/US$6 for foreigners. Shuttle Ai Ais – Hobas NAD270/US$20,5 pp. How to book Fish River canyon hike? Booking is compulsory. First, you phone one of the numbers provided to inquire availability. In Windhoek, Namibia (+264 61) 285 7333 reservations@nwr.com.na. 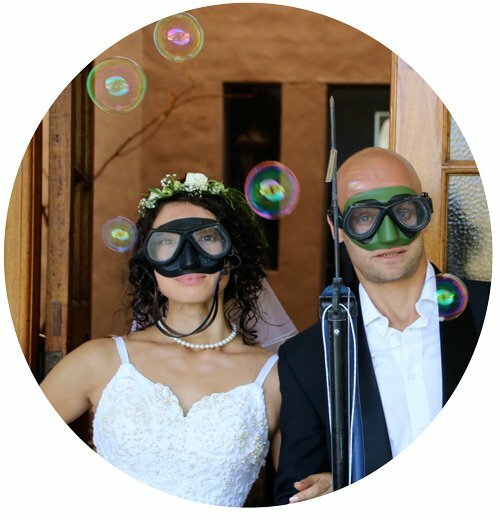 In Cape Town (+27 21) 422 3761 ct.bookings@nwr.com.na. If any suitable for you dates are available you book them over the phone. After that you have 48 hours to pay a deposit (10%) to confirm your booking. Then you send an email with a confirmation of the payment. The total amount must be paid 30 days prior the hike. Attention! According to the rules you have to be minimum 3 persons to make a reservations but in fact you can always book for three and show up only two with some excuses that your hiking buddy got sick and try to hook up with another group to get to the start after you can walk on your own. How long beforehand do you have to book the trail? We booked in the beginning of April for the second week in May, when we phoned there were still 4 or 5 days with 5 or so spots in May open so it’s possible to book just a month before. But if you have specific dates we’d suggest to book the hike two or three months beforehand. Only 30 people per day are allowed to start the hike. A French couple we met hiking booked it just 5 days before and they still could get a spot. Very important to bring a medical certificate proving you don’t have any health problem. The certificate must not be older than 40 days. A form will be sent to you after you make a payment for the hike or you can download it HERE. This form must be filled in by a doctor. We don’t know what can happen if you arrive without it very likely you won’t be allowed to walk. At Hobas the first thing they asked us was our certificates but they didn’t really looked through just took them and put in a folder. We thought it was ridiculous but actually every year there are people rescued by helicopter or park rangers (from emergency exit) because they can’t continue the hike. We met a man who spent 2 days waiting for the rangers to get to him he got a heat stroke and couldn’t walk any more. Where to stay before the hike? Basically you have the same options as for parking; Hobas (NAD170/US$13 pp camping) or Ai Ais (NAD190/US$14,5 pp camping). Most people stay at Ai Ais for a good reason Ai Ais is just nicer; green grassy camping area with trees for shadow, many toilets and showers, electric stoves for cooking and of course the highlight the hot springs. You can’t imagine how nice it is after the hike to relax in hot springs! Ai Ais Hot Springs Resort, ideal place to chill after the hike. Where to leave your car? You can park your car for free either at Ai Ais (hot springs) or at Hobas (starting point). Both places look equally safe which one to choose is up to you. We left our car at Ai Ais and took a shuttle to Hobas in the morning before the hike. That worked out really good. When we finally arrived at Ai Ais on the last day our car with all the stuff was here. Believe me you’ll be tired after 4-5 days of walking and won’t feel like driving for an hour to Hobas get your car. Our French friends parked their car at Hobas and had to wait for the shuttle till 5pm. How to get from Ai Ais to Hobas? The trail starts at Hobas, you have two options; to take a shuttle before the hike or after the hike depending where you leave your car. There is always a shuttle going to Hobas in the morning at any time after 6am. You don’t need to book it beforehand we arranged it when arrived at Ai Ais. The shuttle can take 11 passengers at once. Shuttle from Ai Ais to Hobas, the start of the hike. What to expect from the hike? The hike is very different from most of the hikes we’ve done. The trail is not very easy to walk; sand, rocks, river crossing etc. The weather; it gets very hot during the day and very cold at night so you need both sun protection and warm clothing/sleeping bag. Sun, you walk in the sun all day you get a bit of shade here and there early in the morning and late evening but the most part of the day there is nowhere to hide. Our superteam at the starting point of Fish River canyon hike. Water is always available since you walk along the river but it’s recommended to take some purifying pills or filters more for precaution. You don’t want to get sick in the canyon it’s not that easy to get out. We always used chlorine water purification tablets; tastes terrible but kills 90% or so bacteria. What to pack for the hike? Don’t pack too much the more you pack the more you carry! Our main issue on the hike were shoes, both me and Campbell were wearing hiking boots and both had terrible blisters all over our feet and we had hiked in them quite a lot before. In fact I couldn’t walk in my boots on the second day and put on sneakers. Our French friends that we met had exactly the same problem and a girl ended up walking in her flip flops with thick socks. Our third hiker was wearing trail running shoes and had no issues at all, they were very comfortable for walking on sand and jumping over rocks. We’re tend to blame the heat it was very hot in the boots and they were full of sand all the time. We’d recommend to wear long pants and long sleeve shirt it’s the best protection from the sun and you’ll be hot and sweating anyway even if you walk naked. Hat, sunglasses, sunscreen – all must have, Namibian sun is extremely strong. Comfortable clothes (e.g. fleece, pants, flip flops) to change, always nice to sleep in clean clothes. Towel, there will be a possibility for “showering” in the river every day, one day you even get hot sulphur springs. Underwear, socks, how many pairs to take up to you. Most people don’t carry a tent neither did we. It adds 2-4kg to your luggage which is a lot, it’s definitely warmer to sleep in a tent but a proper sleeping bag solves this problem. Moreover the night sky in the canyon is fantastic it’s nice to fall asleep under it. Mattress, we had self inflatable small mattresses and were very happy with them but if you take foam rolled up one you’ll be ok you camp on sand so it’s already soft enough. Sleeping bag, take a good one, we had our summer bag for 11C min and one night were freezing in them we had to put on all our clothes to last till morning. And we hiked in May if you do in In June/July it’ll be even colder. We’d say take a sleeping bag that can go to 0C. Hiking poles, we never use them but many people do for me they make the most sense for steep downs and river crossings, here you’ll have both so it’s up to you to take or not they aren’t really heave. Camel pack/water bottle, we found camel packs very handy. Water purification tablets or filter. Map, you can buy it at Ai Ais or Hobas. If you hike Fish River canyon for the first time it’s a must have. Stove, we have a small portable gas stove that we always take hiking, it’s good enough to boil water, cook pasta or oats. Gas, depends how many you are and how much cooking you want to do but we’d say take 500ml it’ll last for 4-5 days for sure. Pots, we had a set of two; one for food one for boiling water if you can manage with one only a bit more uncomfortable. Swiss knife, we love this thing many functional; opens cans, cuts, slices etc. Cutlery, take a plastic or bamboo forks and spoons. Cups, we had two very light plastic cups. Lighter/matches for your stove, no fire allowed in the canyon. Breakfast – instant flavoured oat sachets (3 for two people), coffee. Snack – energy bar/nut mix. Lunch – billtong/droewors (we always take it when hike in South Africa), crackers. Dinner – a can of tuna, 250g of pasta, one tomato sauce sachet (for two people). Map of Fish River canyon hike. We started the trek at 10am. The descend to the bottom of the canyon took us a bit less than 1 hour. It was quite steep but not as tough as we thought. Once at the bottom in 2km you reach the river and for the next 4-5 days you’ll just follow it. We walked about 20km on the first day it took more or less 7 hours including lunch break. If you want to take it easy you can camp right after the descend, at the river there is a nice sandy beach. This day we didn’t see any signs showing the distance or directions but it’s impossible to get lost you just follow the river. There are no ups and downs on the route but you walk on sand and rocks all the time so it’s not a very fast walking. You can camp anywhere you want just find a nice sandy spot next to the river. We camped somewhere between the first emergency exit and Palm sulfur springs. Second day early morning near to our camping spot. We started at 8.30 and walked for about an hour before we reached the Hot springs. Actually if you are a good walker and start your first hiking day early enough you can make it all the way and camp here the first night. The hot spring is in fact is a stream that goes into the river and water in there is very hot you have to mix it with cold river water. We spent about 40min. swimming and chilling here it was really nice. On the second day the trail goes through difficult terrain; sand and rocks so you make slow progress plus we made two long swimming/resting stops. By 4pm we quite tired and my feet were destroyed so we decided to camp on a small beach next to the river. We had a fantastic night sky and the full moon didn’t even need our headlamps. In my opinion the canyon at night time is the best! This day again we didn’t see any signs or distance marks. We reached Palm Sulphur spring after one hour of walk. What a pleasure to relax in hot water springs with an amazing view! An early start 7.30 or so and maybe the longest hiking day for us, we walked for 8 hours but in a way it was our own fault we missed one shortcut. The third day is the main shortcut day on the hike. There are three significant shortcuts; we missed the first one where you climb over the mountain, the second one at 50km was easy to spot from far there is a big word “Short cut” written on the rocks, the third one comes right after that when you reach the river. For the terrain the third day was probably the most difficult as well some river crossing, rock jumping and sand walking. By 4pm we all were quite tired and my feet were quite destroyed. We found a nice spot on the beach not far from the emergency exit and camped there. This night was the coldest our of three we spent in the canyon, it was freezing! We all woke up a couple of times during the night to put on more and more clothes. By the next morning me and Campbell were wearing everything we had in our backpacks. But the sleeping bags that we took with were very thin for 11C min. So if you have warmer sleeping bags at least for 5C or lower you’ll be ok.
Third day of the hike, beginning. The scenery on the last day was the least impressive, the canyon reduces significantly it reminds a rocky valley more than a canyon. Due to a very cold night we all woke up quite early at 5am packing didn’t take long and in 30min. we were ready to roll. It was the easiest and the shortest day for us; first part you walk on a 4×4 trail, then some sand and rocks and finally a nice easy path all the way to Ai Ais. We arrived there at 1pm and were absolutely happy to take off our shoes and to get a cold Ginger beer for me and some beers for guys. Scenery on the fourth day, 3 hours before Ai Ais. A dream of a tired and thirsty hiker! Almost at Ai Ais. After 4 days in dust, heat and cold tired and with blisters we were absolutely happy to relax in the hot springs and to eat some steaks! Our mission was completed! We walked it in 4 days without any particular reason but I’d recommend do it in 5 days you’ll have more time to enjoy, rest, take photos, swim etc. Hello. Great description of the hike. Really looking forward to it. I was scheduled to hike with 2 friends unfortunately both had to pull out due to unforeseen circumstances. Do you know if AI Ais offers guides or of it’s possible join a group at the start? Hello, Takunda! As far as I know there are no guide options for the hike. The best you can do is try to join a group of people in Ai Ais or at the start point. Great resource, thank you. I am going to be doing the hike in May (12 pax) and am still trying to work out what do with vehicles. ( We will be staying near Hobas). In your experience if we leave vehicles at Hobas, is it fairly easy to get a lift for one or two of the drivers the start of the Hike. Also, Does the shuttle at Ais Ais back to Hobas need to be booked beforehand, or do you just sort it out upon arrival? Hi. Great blog. We will be at fish river a big early- around the 15th April. Just rang the booking office and they said they could book us in. You have said that it only opens on the 1st of May. Is that a personal recommendation based on the heat? Or us that something locally which is enforced? If the booking office says you can start on 15th April it means the canyon will be already opened for hiking. It used to be opened from 1st May but maybe this year they decided to open it earlier. I believe it’ll be hot in April, we walked it in May and it was quite hot during the day but at night it got chilly. Hi there: If possible is there someone or hiking club that can assist with open space for 6 people in June(middle to end). Will appreciate it. Thank you. Hello Johan in the article there are contact details in Cape Town and Windhoek for booking the hike, you can contact the NWR and find out which dates are available and book them online or on the phone. Great article. Is the hike only open at certain times of the year or all-year round? Hello, Shaun! The Fish River is opened for hiking from 1st May till mid September. I am planning in doing this next year in August. Was at Ai-Ais last week. What about the baboons, don’t they hassle the hickers? We saw many baboons only at Ai Ais early morning, didn’t see any during the hike in the canyon. Good luck and enjoy Fish River. Hi Informative article. Is a guide a necessity if no one in the group has done this hike before? We have experienced hikers in the group (I have hike quite a bit in the berg). Hi, Lynne! You don’t need a guide even if nobody from your group has done the hike before. All of us did it for the first time and we had no problem. Good luck and enjoy Fish River canyon! Loving all your articles about Namibia! I am looking forward to visit the country. For this hike did you have a guide or you just formed a group on the day with people you met? If you did not have a guide, did you have difficulties finding your way? Hello, Laureen! Thank you very much for reading our blog! 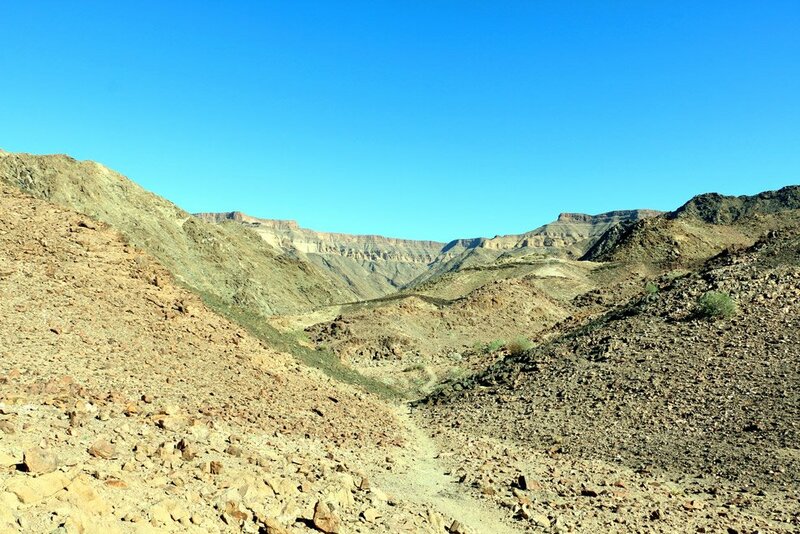 Fish River canyon is a self guided hike, you need to form a group of minimum three to start walking. Though we met a group of only two, I guess it’s possible to be only two people, you can always join another group and walk with them. The trail is very easy to follow you basically walk along the river all the time, except few shortcuts but even if you miss them (as we did one) you won’t get lost you’ll just walk longer route. You can buy a map of the trail with all the shortcuts marked. Hi there, great read, thank you. Would you recommend a “not very seasoned” hiker do the Fish River with seasoned hikers? Hi, Sharon! Thank you for the comment! The hike is quite challenging due to the heat it can be difficult for an inexperienced hiker. If you want to join a group ask them about their itinerary, if they’re planning to do the hike in less than 5 days we wouldn’t recommend you to go with, if they’re doing it in 6+ days it’s easier though you’ll have to carry more food supplies. Thanks for the info. Thinking of doing it with some Worcester people this coming July. They have already booked for five. Keep well. Hello Riaan, thanks for reading. It is an awesome hike I am sure you will have a great time! Let us know if you have any questions. Enjoy! Hi, I’d like to do this hike but i will be alone there, what do you suggest? can i add to other people there? Hello, Federico! Thank you for the question! You’re supposed to be three people minimum to book the hike and booking is compulsory so even if you’re only one you’ll have to book and pay for three (we met a French couple they were only two hiking don’t know if they booked it for two or three people). Once there you can say that your hiking buddies couldn’t make it and try to join any group just to start the hike and then continue on your own. It’s not guaranteed but it’s very likely there will be someone you will be able to hook to. We are doing the hike in 2 weeks time and we were wondering how full the river is. It is said that the fuller the river, the tougher the hike! Hello, Nolan! Thank you for the question! The river wasn’t very full there was enough water for drinking and swimming (in some places) but we had no problems with crossing it. Thank you for your reply. I have read that you have said that no fires are allowed in the canyon. Is this a new rule? I was under the impression that one could make a fire. It’s a bit controversial about an open fire. We phoned the booking office in Cape Town but they couldn’t tell us exactly if it’s agains the law or rules or just unwelcome but they do try to dsiencourge you from it. We were advised not to make a fire in the canyon. The official info we got in the e-mail says “Do not scar the environment with unnecessary fireplaces. Use existing once.” We didn’t see any existing fireplaces on the hike but maybe because it was a very beginning of the hiking season. And another thing there wasn’t really fire wood in the canyon I know some people bring the wood with them for the first night. Don’t know if you want to carry it with?! Good luck and enjoy the hike!